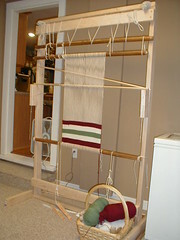 Posted on January 18, 2008	by Linda S.
This entry was posted in Handcraft, Handwork, Historical Textile, Tutorials, Weaving and tagged Crafts, handmade, Navajo loom, tutorial, Weaving. Bookmark the permalink. How do I get to the plans for the Navajo Loom?